After a long, hard battle I finally finished Alyssa Thomas' Crocheted Thoughts block for The Splendid Sampler. If you are asking "Why was this block a battle?" I have answers for you. After I started stitching this block, my body fell apart. After 25+ years with lined bifocals, I am adjusting to progressive lenses in my eyeglasses. My neck is getting sore from bobbing my head around trying to look through the right part of the lens. If you've ever fought this battle, you feel my pain. I had a lot of trouble threading the needle and it's difficult to embroider without a threaded needle. The drastic weather changes in the last weeks have caused my arthritis to act up. My hands have not been working well enough to hold a needle. I apparently can't encounter a cold or virus that I don't adopt and take home with me. I got hit with a double-whammy of illness last week. I am now strong enough to sit up in a chair and am enjoying not coughing or sneezing for nearly 10 minutes at a time. Finishing this block was a huge victory for me. I'm celebrating spring and dead germs and new eyeglasses and working fingers. I'm also celebrating a really cute block! Thanks Alyssa! If you want to see how amazing everyone's Crocheted Thoughts blocks look, click HERE and scroll down to see all the wonderful blocks! 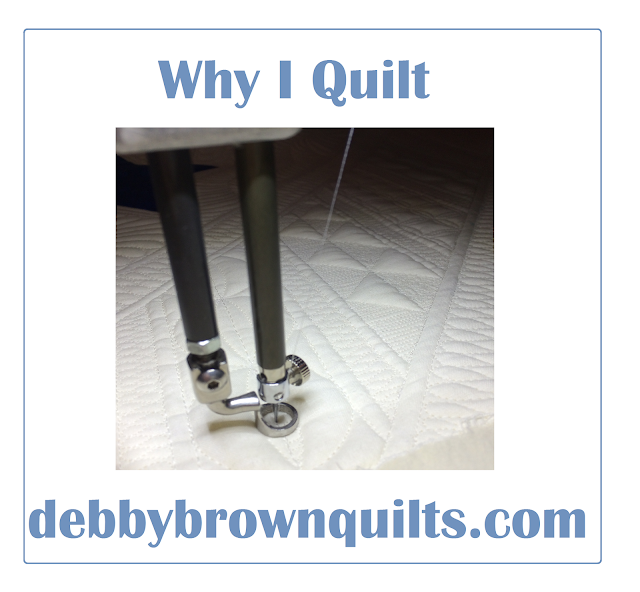 Did you read my "Why I Quilt?" introduction to The Splendid Sampler machine quilting tutorials? I'm hurrying off now to catch up on the rest of my blocks. Are you current on The Splendid Sampler? I'm all caught up on this block of the month quilt, Inez's Walk Around the Block, from Quilt Basket. It is fun using such a limited palette (gray, black, and white) but letting the texture do the work. These Moda Modern Ink fabrics are so lovely to work with! I feel wonderful being caught up on this project. I think I'll celebrate by starting a new quilt! For Christmas, I promised Mom that I would send her a new set of placemats each month for 2016. I chose a really simple quilting pattern for these placemats since they are meant to be used and slopped and stained. Tons of pretty quilting is unnecessary for these simple utilitarian placemats. It is my goal to have a meal and sleep overnight in all 50 of these United States. I have achieved that with 40 states so far, but I am not sure if I should consider Iowa or not. The first time I was in Iowa, it was in the back of a taxi as it drove me from Omaha, Nebraska to Kansas City, Missouri. It's a really, really long story. That $450 cab ride went through four states, but I didn't have a meal or a hotel room in any of them so I didn't count it. The second time I was in Iowa, I technically fulfilled both requirements, but I was in the state less than 18 hours. I arrived, can't remember if I had dinner, slept, had a death in the family, and ate a breakfast sandwich at the airport as I flew out mid-morning. I think I would like to visit Iowa again, just to make sure I can officially count it as having eaten and slept there. The current block for The Splendid Sampler is named Iowa. Sherri McConnell designed this scrappy snowball block and I really enjoyed making it! April Rosenthal's Meadowbloom fabrics make this block sing! If you want to see how everyone else's Iowa block turned out, click HERE and scroll down. 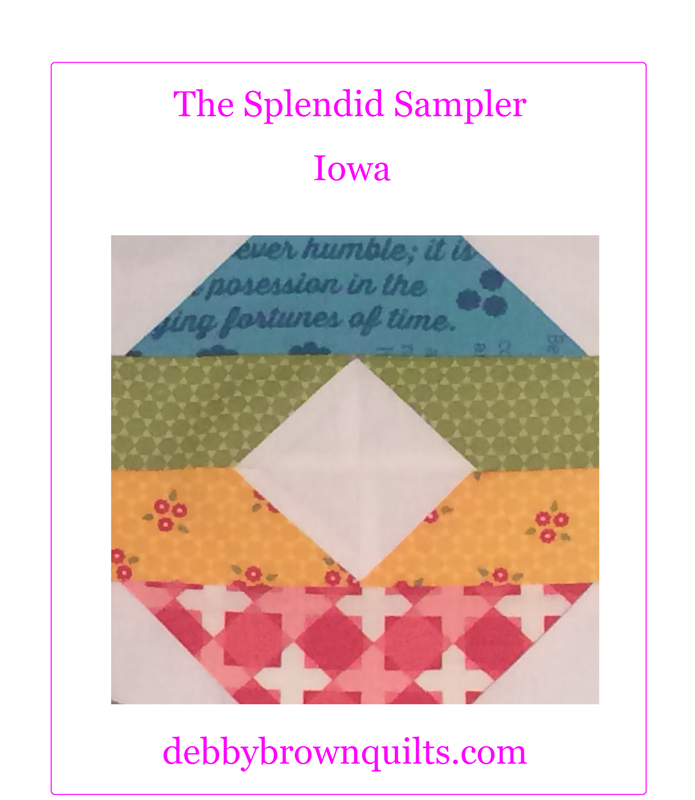 I am so excited that the machine quilting tutorials for The Splendid Sampler are rolling out soon. Are you ready? How would you quilt this block? 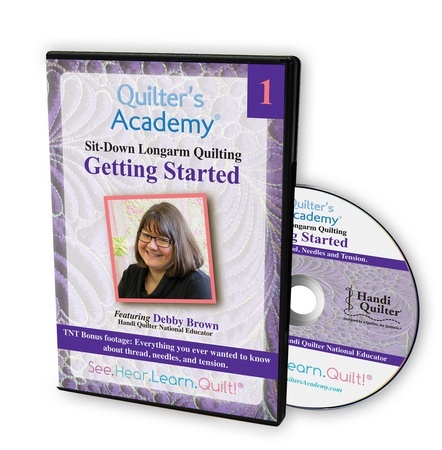 While you are waiting for the tutorials, I encourage you to check out my Handi Quilter DVDs all about sit-down longarm quilting. Every day of February was spent either out of town or jetlagged/sick. I did shockingly little quilting and am terribly behind on my block-of-the-month obligations. 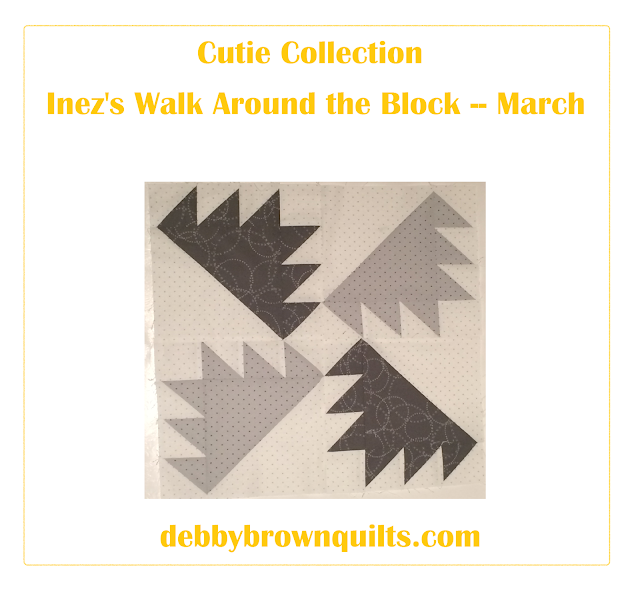 Like Inez's Walk Around the Block from the Quilt Basket. 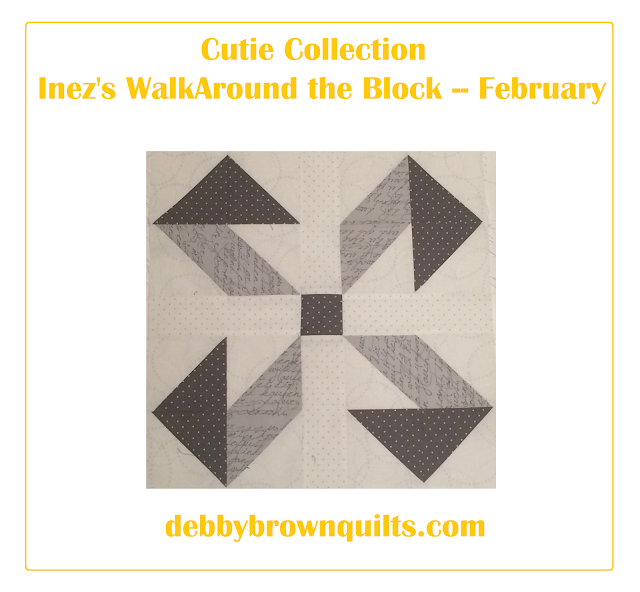 Are you making this Cutie block of the month? Are you making others? Brag if you are current on your obligations! I am in love with quilting, specifically the process of holding the three layers of a quilt together. Piecing is pleasant, but my passion is found in the stitches that hold a quilt together. When my babies were young, I started hand quilting. I fell in love with the subtle textures achieved one single stitch at a time. 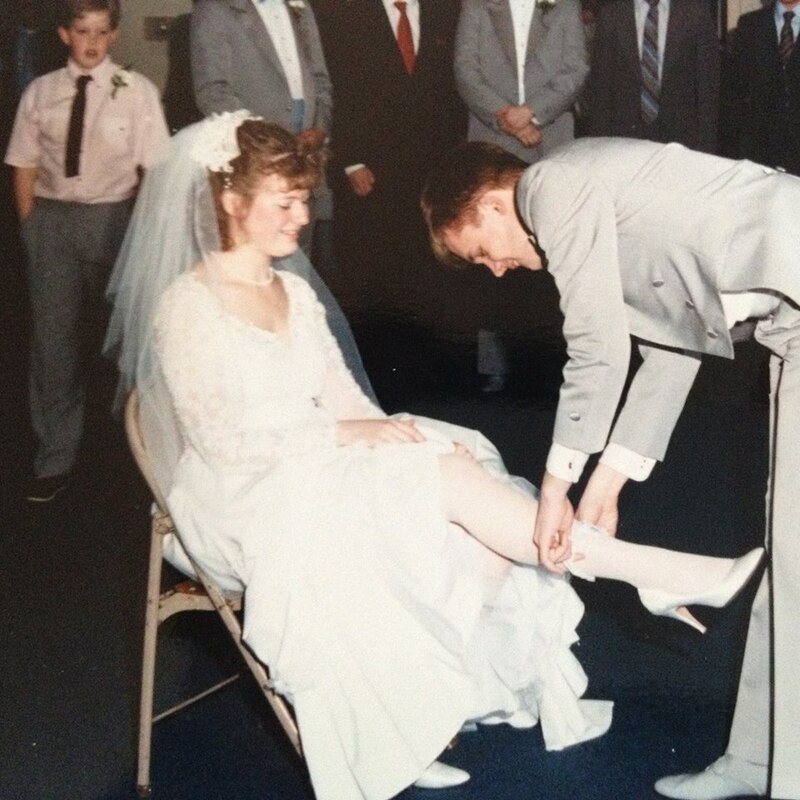 As those babies grew into teenagers, I worked as a longarm quilter. While quilting 5,000 quilts for customers, I learned about battings and threads and textures and quilting plans. Now that I am an empty-nester (and a grandma! ), I machine quilt on a sit-down longarm machine and pursue it as an art form. 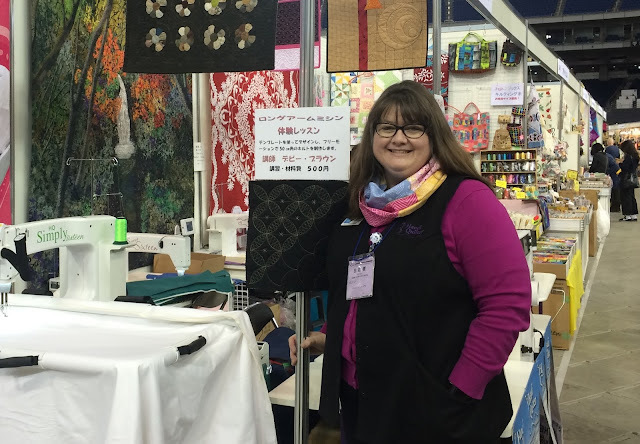 Over the last decade, I have traveled the world teaching thousands of quilters to machine quilt their own quilts. No matter the country or language spoken, quilters are the same wherever I go. When someone gets married, we make a quilt. When someone is sick, we make a quilt. When natural disasters strike, we make quilts. When a baby is expected, we make a quilt. We dig through our scraps and stashes. We excitedly buy pre-cut selections of fabrics from our favorite designers. We run to the local quilt shop and fondle the bolts, carefully choosing each piece for a quilt. The moments we steal away to work on our quilts are precious moments and are made even sweeter if we are blessed enough to be quilting with friends. Once the quilt top is complete, quilts can be tied or hand quilted or machine quilted. The quilting can be a necessary evil or the most exciting part of the quilt (I’m raising my hand, here!). 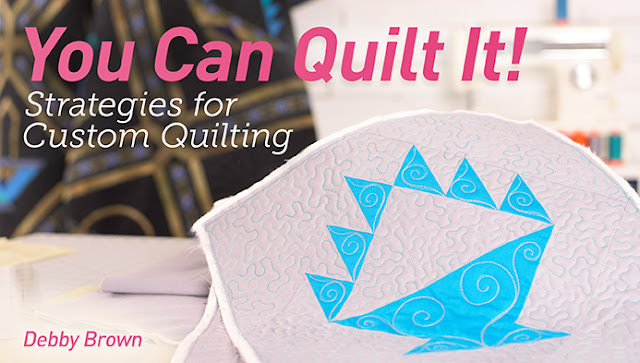 The quilting can be simple and utilitarian, intricate and beautiful, or even done by someone else but if the quilt isn’t quilted… it isn’t a quilt! That unquilted quilt won’t snuggle a baby, grace a home, comfort the sick, or remind a college student that someone at home is thinking of them. Those unquilted tops, piled in the closet, are unrealized dreams and promises unkept. The quilting, often thought of as a chore, is important because it stitches that quilt together and holds the love inside the quilt. As you are piecing your quilts, I encourage you to think of what type of quilting will suit that quilt best. Does the quilt simply need to be held together? Does the quilt have areas that would benefit from some decorative quilting? Are you able or willing to quilt the quilt yourself? Do you partner with a longarm quilter to finish your quilts? Plan for your quilting while you are piecing your quilts so that you will be prepared to finish them. 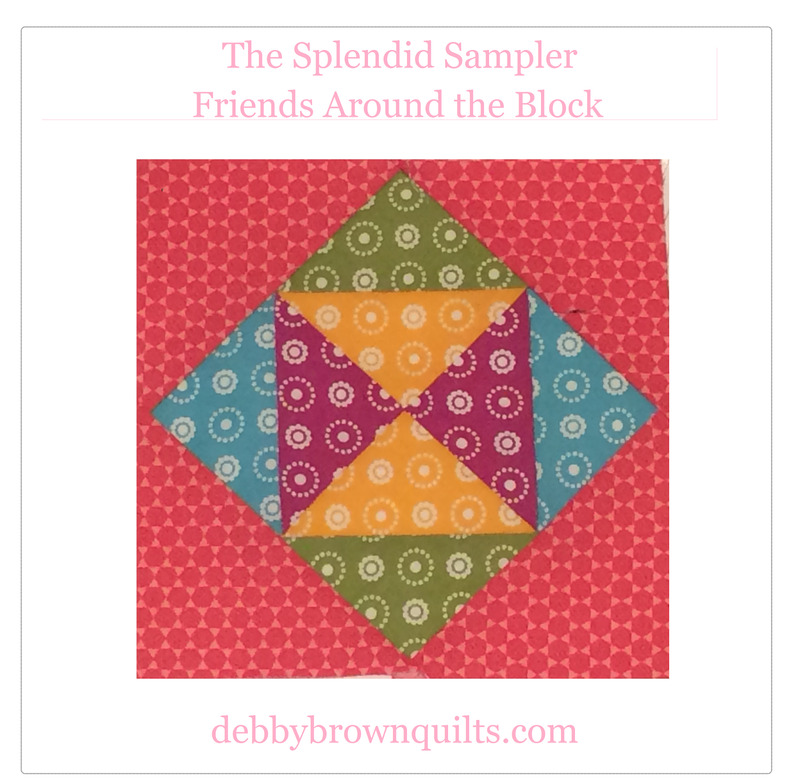 I will be providing machine quilting tutorials for TheSplendid Sampler throughout the year. I won’t be quilting my finished top in these tutorials because I’m making my quilt along with you! What I will show, though, are techniques suggested by some of the blocks. It is my hope that these tutorials will give you ideas for how you might want to quilt your Splendid Sampler quilt when it is finished, but also ideas for finishing some of your other quilts. So, why do you quilt? Is it your passion? Is it a chore? Jane Davidson did it again! She designed another great block for The Splendid Sampler project. 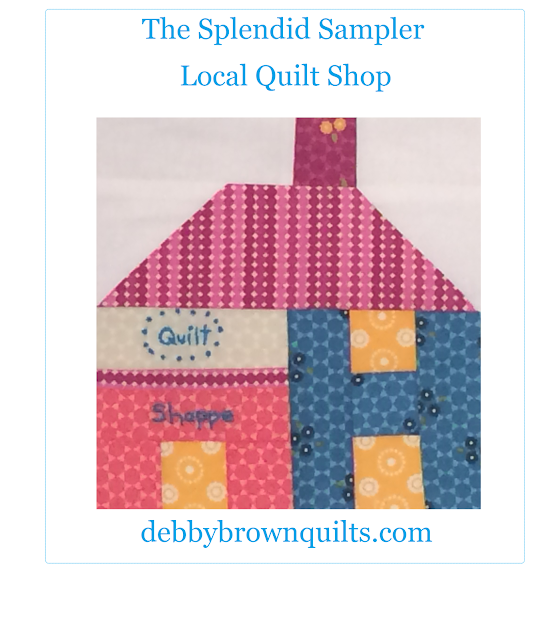 Local Quilt Shop was so much fun to make. The French knots are officially the second French knots I have ever successfully made. I will never discuss the hundreds of failed attempts from my childhood. I'm tickled to announce that French knots are my new super-power! April Rosenthal's Meadowbloom fabrics make a sweet Quilt Shoppe, don't they? If you want to see everyone else's Local Quilt Shop blocks, click HERE and scroll down. Stay tuned for my the announcement about my machine quilting tutorials for The Splendid Sampler. Sign up for my newsletter to be sure not to miss a single one! This eighth block of The Splendid Sampler was likely the easiest to piece so far. Friends Around the Square was so fun! Thanks, Julie Karasek! Many of my blocks have white backgrounds, but a few don't. I chose to make this block without background to help balance out the quilt blocks when I've finished all 100 blocks. April Rosenthal's Meadowbloom fabrics kept this block bright, even without background fabrics. Check out all of the other Friends Around the Block blocks HERE. I am hard at work on some splendid new things. Be the first to hear all of the news by signing up for my newsletter HERE. 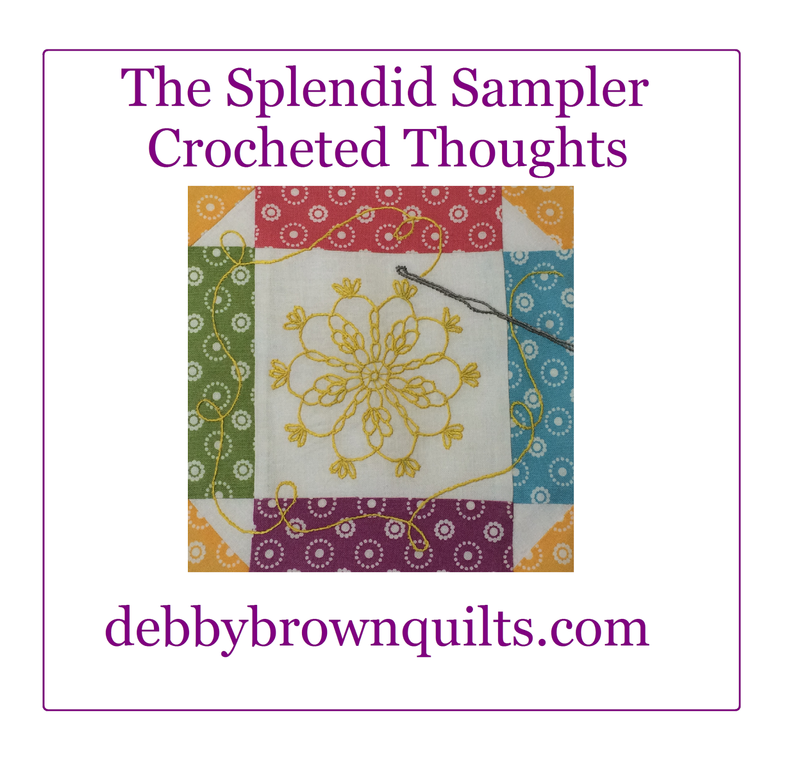 Have you been participating in The Splendid Sampler? Have you been keeping up with the two-blocks-a-week schedule? Pat and Jane have issued a challenge -- Make and post your first seven blocks and be entered to win a bundle of lovely fabric, threads, and patterns. Read all about it and post your blocks HERE. Stitching the Snug as a Bug block by Amy Sinibaldi for The Splendid Sampler was pure joy! I joined The Splendid Sampler to provide machine quilting tutorials, but it's already been so much more than that! I have been introduced to new-to-me designers and their work. I have learned different techniques. I learned that I absolutely adore hand embroidery! If you want to see other Snug as a Bug blocks, click HERE and scroll down. I hope that many, many more blocks will be embroidered so that I can pursue this new passion of mine! Have you started thinking about how you are going to machine quilt The Splendid Sampler quilt when it is finished? I am preparing special tutorials that will be released soon. 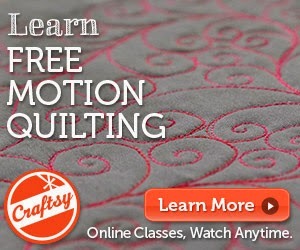 If you want some inspiration now, though, check out my Craftsy class You Can Quilt It! Strategies for Custom Quilting. I will definitely stop here again and try to do so earlier in the morning when they still have Boston Cream and Jelly-filled doughnuts. Now I'm positive there is a good reason for the Italian restaurant to have a French name, but no one I asked knew it. Most chuckled and said that they'd never really thought of it before. I am a quilter. I quilt as my job -- teaching, designing, writing -- but I also quilt as my hobby. When I need some time to myself, I start a new quilt. A while ago I dove into my scrap bin and started Square Dance. I am tickled to report that I finally finished it! What you see in this photo is my finished, machine-bound quilt thrown over a wood pile in my yard with the stream running behind it during a rare sunny moment in winter. What you don't see is iocane powder the mud on my shoes! The quilt is fine but I stepped in a mud puddle on my way to the woodpile. The lengths to which I will go to get a decent photograph in winter! I used one of my new FabuLux threads (stay tuned for news!) called Midas Touch. It is three shades of gold and made this brown quilt GLOW! Sadly, I still have scraps of brown fabric left, but I am a quilter and I know what to do with them. Thank you, Natalia Bonner, for a wonderful block! Your Focal Point block has a great story behind it! I love the words on April Rosenthal's Meadowbloom Fabrics. You should definitely check out everyone else's blocks HERE. I'm preparing some machine quilting tutorials for The Splendid Sampler project and this block sparked some great ideas! 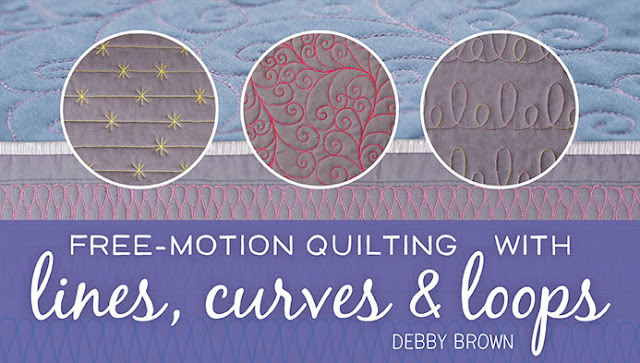 If you are looking for a class on free-motion quilting, I am very proud of my Craftsy Class "Free-Motion Quilting with Lines, Curves and Loops." I had a WonderFil time last week at the WonderFil Threaducation Center in Calgary, AB, Canada. I flew in a day early because I have the worst luck with flights and wanted to be sure to arrive in time! Since I arrived only 12 hours late (nearly a success! ), Allison was a gracious hostess and drove me to Banff on my extra day in Canada! And I didn't fall through the ice. I may have slipped and slid, but I never fully fell down! These eggs are "basted." Kind of a cross between sunny side up and poached. Never have I ever heard of this! I use a fork! Yes, I'm a class act. Someday, Aie, I will finish my Waterlilies quilt. No, really, I mean it! If you want to read more about my classes at the WonderFil Threaducation Center, check out Allison Spence's blog post. She is a fabulous quilter, hostess, and teacher. If you are near Calgary, try to stop in and take a class from her! Those further away should read about her quilting adventures on her blog and then plan a trip to Calgary!